Add these products to really upgrade your workstation and be the envy of the office. Feeling like refreshing your workspace?. Plants, pets, and new decor are small improvements with big impact. Here are some great desk accessories that will help you revamp your workstation and make your space the talk of the office. Keeping your smartphone charged can be a daily battle. Usually by noon, it is already time to give our smartphones some extra juice so that we can get through the rest of the workday. Avoid unsightly cords and opt for a more “natural” look. 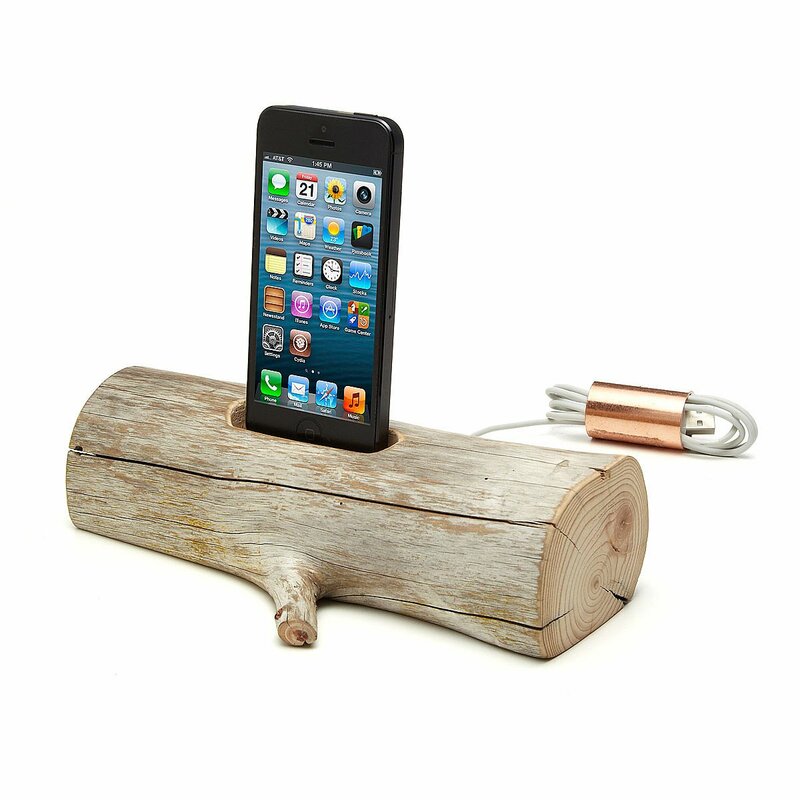 The driftwood iPhone charging dock is a cool and useful item you can use on your desk. It is handcrafted in Maine from natural driftwood by Lee Goodwin. The wood is collected from the shores of Maine to be cut, shaped and sized to fit your device. This driftwood iPhone charging dock is a great alternative to the standard docking station and is also a great upgrade for your workstation. Throughout history owning an exotic pet has been a symbol of power and wealth, designed to strike fear into enemies. This 2”-3” pet may not shake up your office visitors but is one unusual pet that will be a funky addition to your workstation. Winner of the 2011 Global Pet Expo Product of the Year, the one Jellyfish Kit from Jellyfish Art, comes complete with a tank, a jellyfish (up to 3), and a 3-month food supply. Ever wish you had more cilantro on that taco you had for lunch or extra basil for your caprese salad? With the ZeroSoil Mini Indoor garden for your workstation, just plant your seeds in the in the soil-less planting mix, add water and you are done. The planter automatically controls the amount of water that the seeds or plants are getting, so you don’t have to worry about over or under watering. If that isn’t easy enough, the planter will automatically remind you to fill it with more water. Growing plants at your desk has never been easier! If you are looking to do a complete overhaul of your workstation or just buy a few luxurious desk items, check out the Grovemade Desk Collection. Each piece isdesigned, manufactured, and hand-finished by Grovemade in Portland, OR. Not only do each of the pieces radiate luxury, they are very functional and well thought-out. For example, the keyboard tray is an ergonomic keyboard stand with hidden desktop storage. Find everything you need here to make your desk functional and sophisticated. The Jarvis Bamboo Adjustable Standing Desk is easily one of the most versatile and eco-friendly desks on the market. It is not a surprise Jarvis Desk has been named the best standing desk by The Wirecutter for the last three years. Without removing anything from your desk, the LED handset allows you to raise or lower the height of the desk to fit your sitting or standing needs. Not only is the desk technologically advanced, but it is also eco-friendly. The material comes from bamboo that was harvested without any fertilizers or pesticides and the color is completely natural without any dyes or stains. The Jarvis Desk is the penultimate desk in both functionality and design. Using a standing desk can be exhausting and by the end of the day, your posture may be so bad that you start looking like the hunchback of Notre Dame. To avoid being nicknamed Quasimodo in your office, try using the Wurf Board. The Wurf Board is the most innovative way to stand at your desk for long periods of time. While you are standing, you can be stimulating micro movements which improve circulation, improve your posture and make it easier to stand longer. The Wurf Board is inflatable so it is light(3 lbs. ), easily stored and can be adjusted to be harder or softer depending on your needs.